As of lately, I have been crushing on the color orange... its the perfect shade for Fall. And, it matches all the pretty holiday things (pumpkins, fall leaves, candy, sunsets etc). This color just warms my heart! Luckily for me, I now have these gorgeous earrings in the pretties shade of orange and they match my new orange flats (that I scored for such a great deal)! A little match matchy never hurt no body!? To enter the Lisi Lerch Giveaway follow the Rafflecopter below ! And make sure to check out how these fabulous ladies styled their pair! Love this bag! Perfect for fall. Love the outfit and the pops of orange. You're so gorgeous! I love this chambray top! 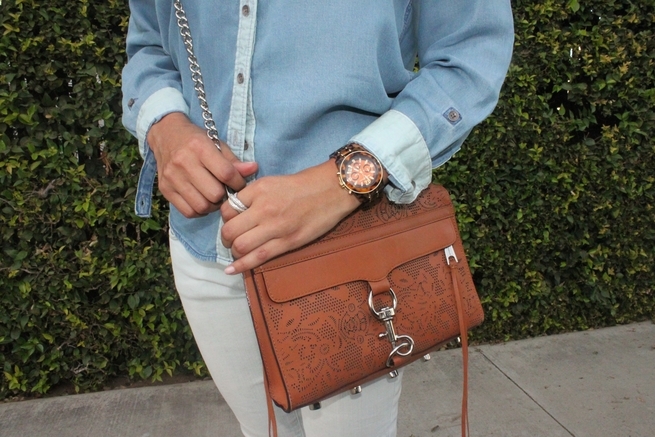 The pop of orange in the shoes is so pretty, and I am loving the bag too!